It’s a good question. Whether it’s football pitch fencing, ball stop fencing, spectator rail or for any other field sport, choosing the right type fencing for your venue is very important. It’s essential that you choose fencing that meets your needs, the needs of your visitors as well as external expectations and stipulations. To help you make the right choice, we’ve put together a free guide to sports and spectator fencing to answer all your questions so you make the right decision. 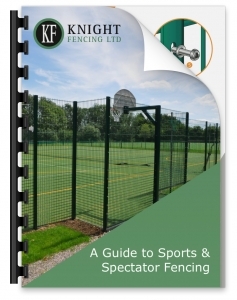 Our expert guide details the many different types of spectator and sports fencing you can choose from and explains what fencing is best suited for what sporting purposes (multi-use games area (MUGA) fencing and games court fencing for schools and public parks; sports ground fencing, event locations etc.). Your free guide also describes how each type of fencing works and its specific functionality. In addition, you’ll find information on fencing quality standards (BS EN codes). To find out more or if you have any further questions please contact us on 01243 641272, 01579 529298 or email us at [email protected]. From multi-use games area (MUGA) fencing to spectator fencing, our product guide will help you find exactly what you need.